The ordinary and usual reason that cities and other units of government issue a Request for Proposal (RFP) is to solicit bidders for a complex project, service, or device that cannot be purchased through ordinary procurement practices. (The related Request for Quotation, or RFQ, is focused more on the cost of large equipment or other easily specified items.) As such, the RFP is usually a completely administrative matter that never rises to the level of the City Council, for example. But in recent years the City of Ann Arbor has attempted to use the RFP as a method of disposing of its real estate while accomplishing a number of objectives, including making money. This has led to a lot of frustration on many sides and is the background of the current proposal from the Downtown Development Authority for the City to turn over the responsibility for managing this process to the DDA. We’ll review some of that history and reflect on what the future of such adventures should be. RESOLVED, That City Council requests the City Administrator to create and issue a Request for Proposals (RFP) for the development of the S. Fifth Ave. parking structure site. Council also told the City Administrator that they would like the RFP to be issued no later than August 14, and to close it to new proposals after 90 days. This gave staff only 5 weeks to write a text and assemble all needed information. The job of assembling the RFP was handed off to a contractor, Ginny Trocchio, who works for the Conservation Fund, usually as staff for the Greenbelt Advisory Commission. And indeed, the RFP has an issue date of August 14, 2009. So what are the parts of an RFP? Typically, it includes a clear statement of what is wanted, a timeline for receiving proposals, qualifications required for bidders, contact information and forms for submitting the proposal, and any information that bidders will need to complete a proposal (in this case, for example, site information). And those are in this RFP. But this RFP also has what is referred to in Trocchio’s email to city staff as the “brochure”. The preamble and much of the RFP itself reads strangely more like a marketing brochure than a factual outline of requirements. Aside from the typos (the name of the city is Ann Arbor, not Arbor) and the garbled syntax (the UM helps to shape the identity of Ann Arbor… “but also the rhythm of the year and the outstanding museums and performing arts venues providing a crowded calendar of events”), this reads more like a business recruitment message than a request for proposals. 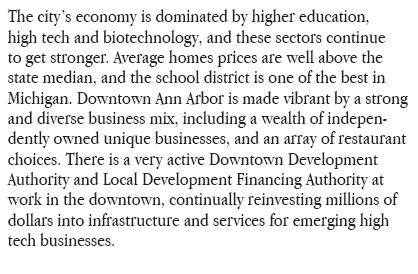 And what do home prices, quality of the school district, and the educational level of potential employees have to do with a development atop a parking structure? Clearly some of this language relates to the additional signals that the Council sent in its resolution. RESOLVED, That the City Administrator shall incorporate appropriate elements of the Downtown Plan for identifying desired community objectives for the site, including open space, active uses at street level, and clear public benefits, which should be addressed in site proposals. Of course, we know why this limited number of people are listed as resources (not technical or administrative people, but heads of agencies). This was really about a conference center, as in the Secret Plan. But as we noted in an earlier post, CM Sandi Smith introduced the concept of an RFP in order to regularize discussion and bring it out into the open. So while the Council’s resolution sought to put that proposal on an equal footing with other possibilities, its existence shaped the expression of the RFP. 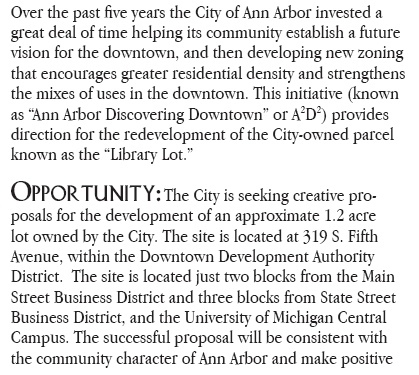 Meanwhile, many other worthy objectives were inserted by Council, like public participation, public use of the space, environmental benefits, and adherence to the planning principles expressed in the Downtown Plan (revised May 2009) and the “A2D2” (Ann Arbor Discovering Downtown) zoning and parking amendments (approved November 16, 2009). and provided a set of scoring criteria with percentages. In the next post of this series, we’ll look at how that worked out. This entry was posted on January 24, 2011 at 5:54 pm and is filed under Business, civic finance. You can subscribe via RSS 2.0 feed to this post's comments. You can comment below, or link to this permanent URL from your own site.